Throughout his life, the chemist George Field (1777-1854) occupied himself not only with the practical aspects of pigments and dyes, but also with the theory of their harmonic relationship. In Chromatics, his first work, an essay written in 1817 on the «Analogy and Harmony of Colours» used the three subtractive primary colours red, yellow and blue, and was concerned with the arrangement of a colour harmony as an «aesthetic analogy» of the musical harmony system. In his essay, Field describes a «metrochrome», an equivalent of the musical metronome comprising three calibrated wedge-shaped glass vessels filled with red, yellow and blue liquids. For our purposes, it is enough to appreciate the reason for the many numbers in his system, without the need for understanding each one individually. 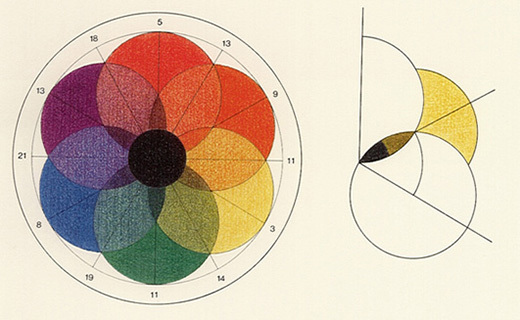 In his «Chromatography» of 1835 — a title sounding to our modern ears like a scientific method — a second discourse on colours and pigments appeared, featuring the «colour-compass» shown. His compilation «A grammar of Colouring» followed, which was chiefly intended for artists, providing them with information on the origin, composition and properties of pigments, dyes and paints. In all three works, Field establishes a link with the works of Jakob Christof Le Blon, who in 1730 had put forward a colour-circle of the three «primitive» colours red, yellow and blue, and the three mixed colours orange, green and purple (thus taking up a position opposed to Newton). 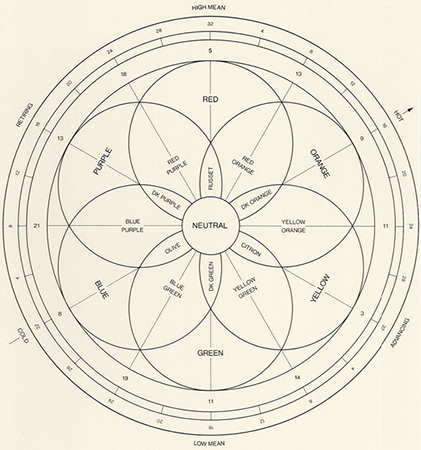 Field declared the six colours of his circle to be primary colours, from which the secondary and tertiary colours arise through gradual change. Whilst Field characterised his secondary colours simply by using double names and saw the three tertiary colours as dark (dk) variations of the mixed colours already mentioned, three special names appear in his colour compass: the mixture of purple, blue and green is called «olive»; the mixture of green, yellow and orange is called «citron»; and the mixture of orange, red and purple is called «russet». Different meanings or connotations marked along the circumference of the circle are assigned to the colours: hot and cold stand opposite one another, likewise advancing and retiring, and a high mean and a low mean value. Both the smaller sketches show us how we can pass through the main circle — from outer to inner, from bright to dark, and from concave to convex. Perhaps at this point we can justify a brief explanation of the link between colours and sounds which George Field wished to establish. Attempts at relating light and music are ancient. Athanasius Kircher was the most recent to reiterate that everything visible to the eye can also be made audible for the ear. It was not until 1760, however, that a developed system for colour music was presented by the Frenchman Louis-Bertrand Castel. He undertook the following, fairly random allocation: C was expressed by blue, and C-sharp by blue-green, D by green, D-sharp by yellow-green, E by yellow, F by yellow orange, F-sharp by orange, G by red and so forth to B, which is represented by indigo. From the triad blue (keynote C) — yellow (third E) — red (fifth G), he arrived at a twelve-step chromatic colour-music scale via different intermediate levels. In 1844, Field suggested an alternative allocation, leaving C with blue, but bringing D to purple, E to red, F to orange, G to yellow, A to yellow green and B to green. His Analogous Scale of Sounds and Colours was based on the triad blue-red-yellow. Deep down, music and colours most probably are related, but their connection is not easily established — a colour piano certainly overwhelms our imagination — even if, with regard to wave motion, we manage to superficially conceive a common physical basis. Sound and light waves are not comparable, indeed they are about as different as any two things could ever be. The principal difference lies in their respective mediums of propagation. Waves can only exist when a carrier — a medium — is available. Ocean waves are carried by water; waves of music and sounds are carried by air. This is demonstrated by the experiment in which an alarm clock is placed in a glass bell and the air is pumped out. The alarm clock can still be seen rattling, but there is silence, because the waves of sound no longer have a propagation medium. But although the sound waves capitulate to the relative vacuum of the bell, light waves manage to pass through it with ease — after all, we can still actually see the alarm clock. Air is not their medium. Indeed, if light waves could not cross the vast emptiness of the universe, we would see no stars. At the time of Field’s death, the scientific world was therefore confronted by a great mystery, namely the exact nature of the medium by which light waves are carried. The physicists had already named this mysterious substance «ether». But how could something which must be harder than steel in order to make possible the minute wavelengths which light was known to possess at the same time be so imperceptible that the planets could orbit within it undisturbed? An initial solution to this great difficulty became apparent after 1860, through the work of the Scottish physicist James Clerck Maxwell. He has not only profoundly influenced the history of light, but also the history of colours. It has certainly now become evident that Field, despite his leaning towards music, considered the origins of colour in another way to Newton, viewing them more within the tradition of Aristotle. To Field, colours arise if the coexistence of light and darkness assumes a varying emphasis. If darkness is predominant, blue will occur; if brightness is predominant, then yellow will occur; if there is an equilibrium, there will be red. As with this construction of polar principles with its positive white and negative black, much remained random with Field — his «chromatic equivalent» being one example. His ideas are not referred to later, and after the work and theories of Maxwell and Helmholtz, Field’s ideas become obsolete — in spite of the beauty of his compass of colours. Date: The colour-circle appeared in 1846 in a book about «Chromatics», which dealt with the analogies and harmonies of colours. Basic colours: Red, yellow and blue; Field also declared orange, green and purple to be primary colours. Bibliography: G. Field, «Chromatics, of the Analogy, Harmony and Philosophy of Colours», London 1846 (new issue of the 1st edition of 1817); G. Field, «Rudiments of the Painter’s Art, or A Grammar of Colouring», London 1850; A. Hope und M. Walsh, «The Color Compendium», New York 1990; John Gage, «Colour and Culture, Practice and Meaning from Antiquity to Abstraction», Thames and Hudson, 1993, pp. 214-216.